Management, Staff & Students Of VIDS & Research Centre like to Congratulate the 3rd Bds students for Winning Awards in the 1st Indian Society Of Periodontology UgConvention held at Ymt Dental College, Mumbai. Sri Kala Sudha Telugu Association is giving Ugadi Puraskar on 7th April 2019. AMPCK of which this institution is a member, has been made aware of certain unilateral changes made by the Government of Karnataka (the GOK). On account of Reddy Heritage Mahotsav celebrations,Baktha Malla Reddy Global Foundation Organised a medical camp at Tirupathi on 03-02-2019 followed by an expert talk on the following topics which was delivered by Dr.Durga Prasad Reddy HOD CTVS - VIMS & RC. 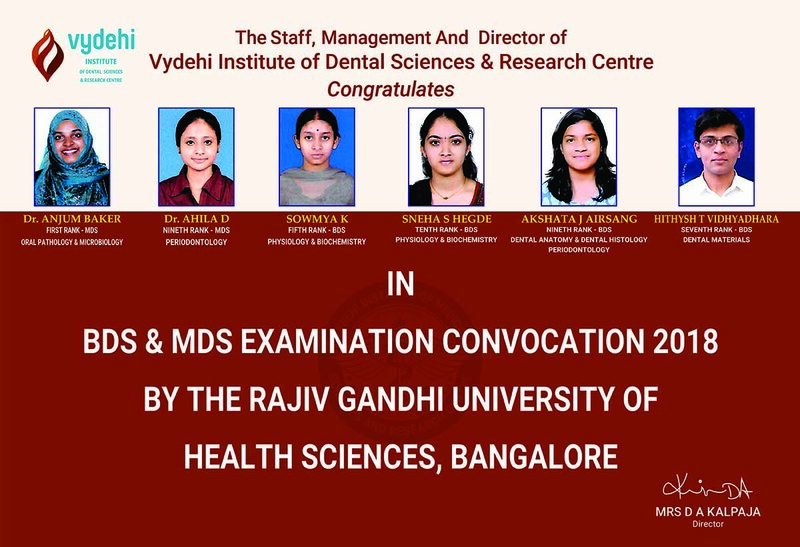 The Staff, Management And Director of Vydehi Institute of Dental Sciences and Research Centre Congratulates BDS & MDS Toppers. We are happy to inform that, we have got 96% results in MBBS Phase III part II( RS2 & RS3) in RGUIIS examination held during December 2018/January 2019. Dr.Rajesh Kumar Singh & Dr.Mahendram awared 1st & 2nd place for paper presentation at KNACON at Davanager on 26th & 27th January 2019. Dr.Sindhu Vasireddy received Second Prize in Quiz Competition at Kerala Association of Neurologists-2019 on 12th & 13th January 2019. Dr.Vijay Kumar Shettar received First Prize for Free Paper presentation and First Prize in Quiz Competion at PULMOKARAN 2019 at Mangalore on 19th & 20th January 2019. 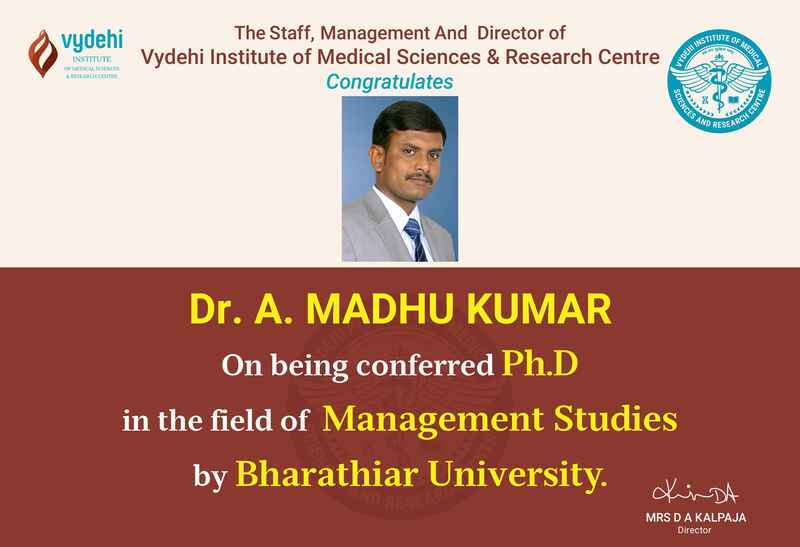 Dr.Prakash K M has been receive the degree of Doctor of Philosophy in Library Science. Dept of Dermatology organizaing Symposium on Leprosy on 22nd January 2019. Dept of Biochemistry has organize CME on Insight Into Quality Management in a Clinical Laboratory on 29th October 2018. Dept of General Medicne has Conducted H1N1 Awareness Programme on 23rd November 2018. Dr.Radhika Mitra is awarded Best Paper Award in XXIII National Conference of Indian Association of Public Health Dentistry held on 30th November 2018. Dr.Rayan has been awarded a second prize in E-Poster Session at INDO-JAPAN OMS Conference in 11th to 13th October 2018..
First year B.Sc. & M.Sc. Allied Health Science courses will commence from 24-10-2018 for this academic year 2018-19. The Department of Anaesthesiology, Critical Care & Pain Medicine is observing World Anaesthesia Day on 16.10.2018 in the lobby of the hospital. Sri P.M Nayak memorial CSI oration is awated to DR. D. Ramesh for the year 2018 for the significant contribution in the field of Cardio Vascular Science. Dr. Shishira. R. Jartarkar has been awarded a second prize in Award Paper Session / E-Poster Session / PG Quiz / Clinical Quiz at the Annual Conference of Indian Society for Pediatric Dermatology. The Fresher's Day for Medical and Dental Students of 2018 batch is being organized on 06 sept 2018 at 9.30 am in the college auditorium. 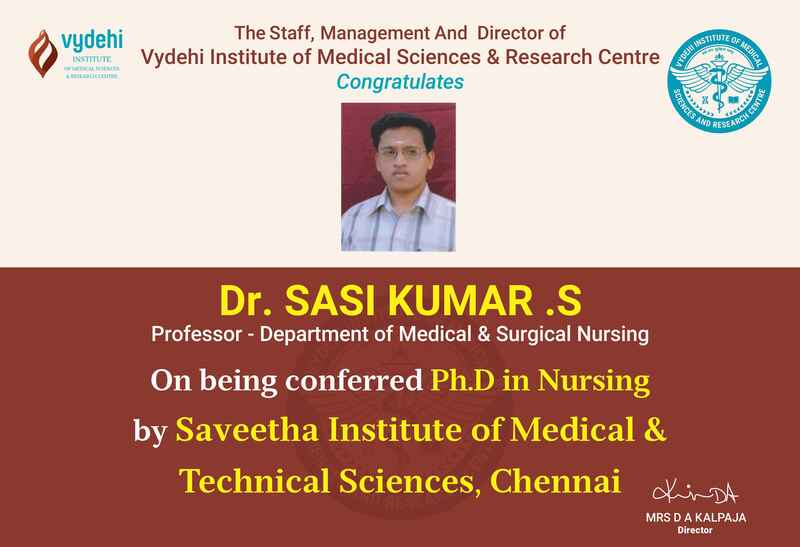 Hearty Congrats to Dr Sasi Kumar S for being conferred a PHD in Nursing from Saveetha Institute of Medical & Technical Sciences, Chennai. 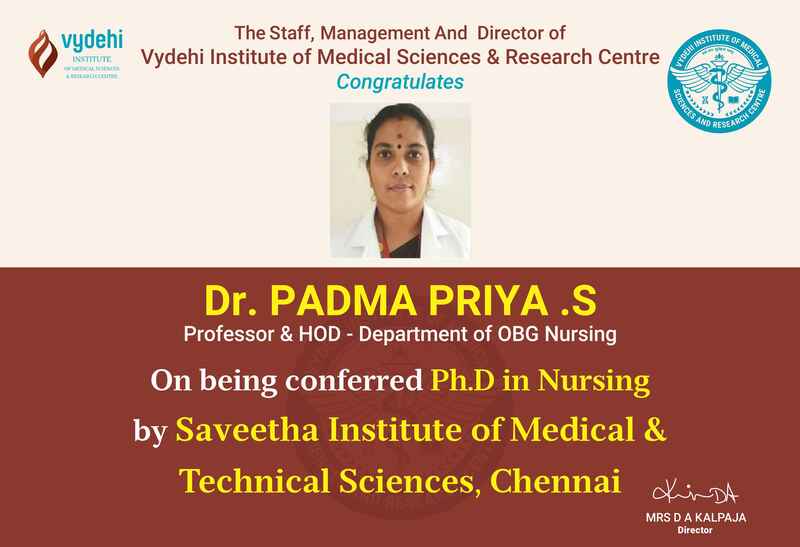 Hearty Congrats to Dr Padma Priya S for being conferred a PHD in Nursing from Saveetha Institute of Medical & Technical Sciences, Chennai. State of Genetic Lab was inaugurated on 09.07.2018 at 10.00 am by Miss .Vydehi. HOD’S of all pre, para and clinical departments were present. Indian College of Cardiology Conducted 25th Annual Conference on 14th - 16th September 2018. M Siddharth has been Awarded for best Abstract Paper presentation. Department of Pediatrics celebrated the "World Breast Feeding Week" from 1st Aug to 7th Aug 2018. Insightful CDE Programs on Dentistry were organized on March 19, 2018 and March 26, 2018. Click to know more. Guest lecture and interactive session will be convened on 29th Dec, 2017 between 12.00 to 1.00PM. The Staff, Management And Director of Vydehi Institute of Medical Sciences & research Centre Congratulates…..
Registrations for participation in CME on Anaesthesia to be organized on January 26, 2018 are now open. For details read on. Checkout out the September 2017 English Issue for latest updates on health and wellness. Checkout out the September 2017 Kannada issue for latest updates on health and wellness. Who has been awarded Fellow of the American Society of Nepgrology. Hearty Congrats to Dr Shivam, IInd Year Pharmacology on bagging ' Best Poster Presentation Award' at WRIPSCON 2017 organized on August 19, 2017 at Ahmedabad. 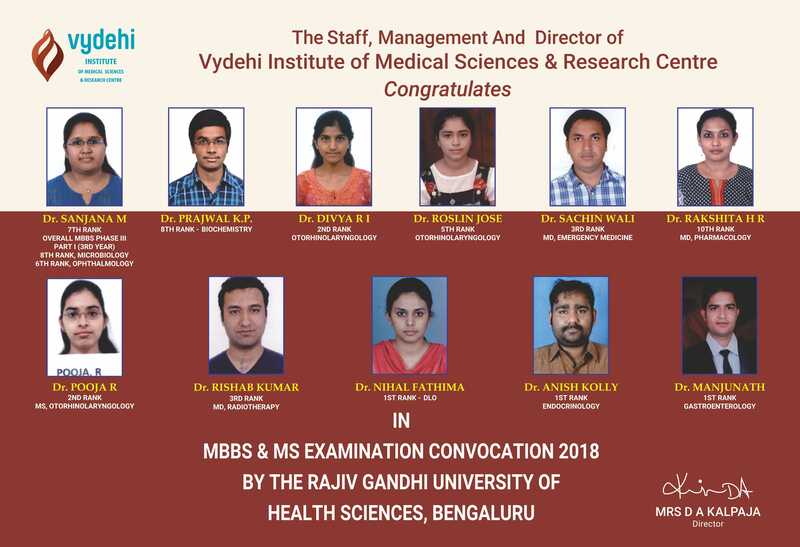 VIMS congratulates Dr Kamlesh TN, Dr Sharanya Vasu and Dr Siddarth Naidu B for bagging Awards in Paper, Poster Presentations and Quiz Competition respectively. Dr Vijeta J of VIMS participated in the first of a kind group show of Arts for doctors organized by art promoter Sameeksha group on Feb 18, 2017. 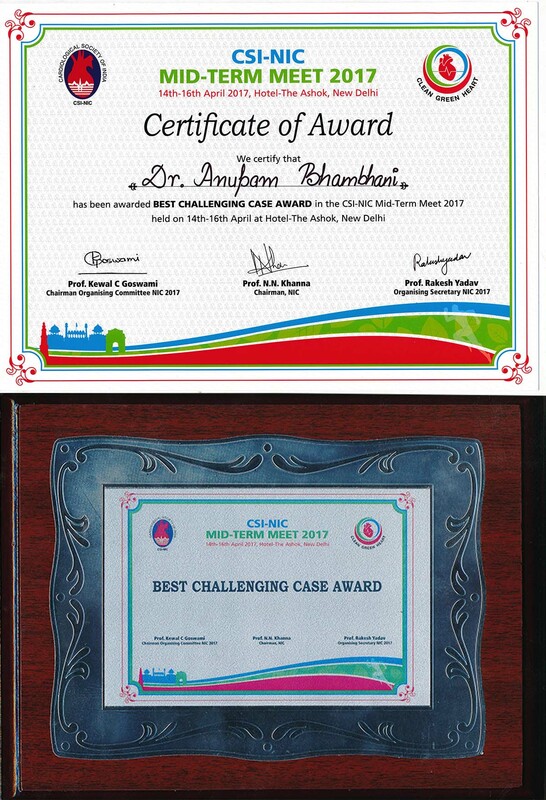 VIMS congratulates their doctors for being first in the world to develop an innovative technique for treating Hepatocelular Carinoma. Prof. Sheldon M Schuster, President of Keck Graduate Institute, CA, USA paid an official visit to Vydehi Campus on March 17, 2017. VIMS and Dr Agarwal's Eye Hospital cordially invite you to the CME Program : Retina Update - Diabetic Retinopathy on March 26, 2017 at the VIMS college Auditorium. VIMS & RC is thankful to each and every participant for making the Kidney Awareness 5K Marathon, organized on March 9, 2017 a grand success. VIMS & RC invites you all to participate whole heartedly in the 5KM run to be flagged off by Cine Star Dr. Shiva Rajkumar as a part of its Kindney Awareness Program on March 9, 2017. SPTA organized the Mangalore Physiocon 2017 that included a quiz Paper & Poster Competition as well as a Inter college Quiz. 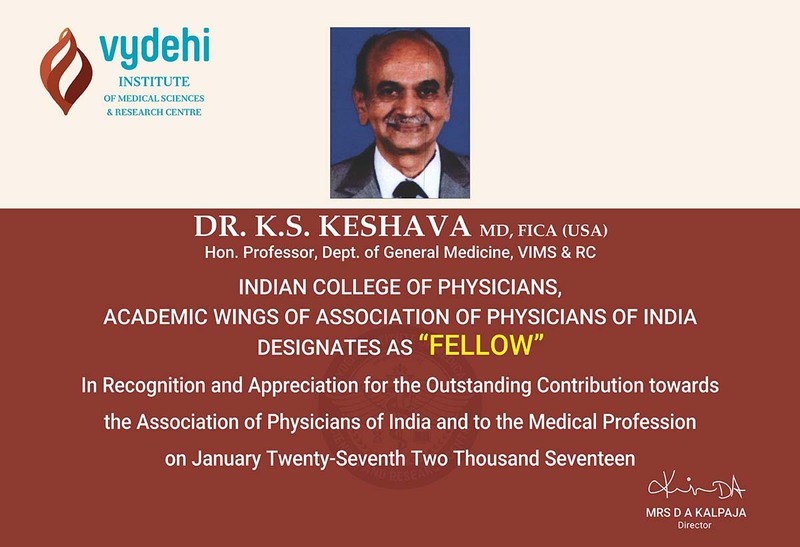 VIMS is proud to announce that Dr Keshava, Hon. Prof., Dept. 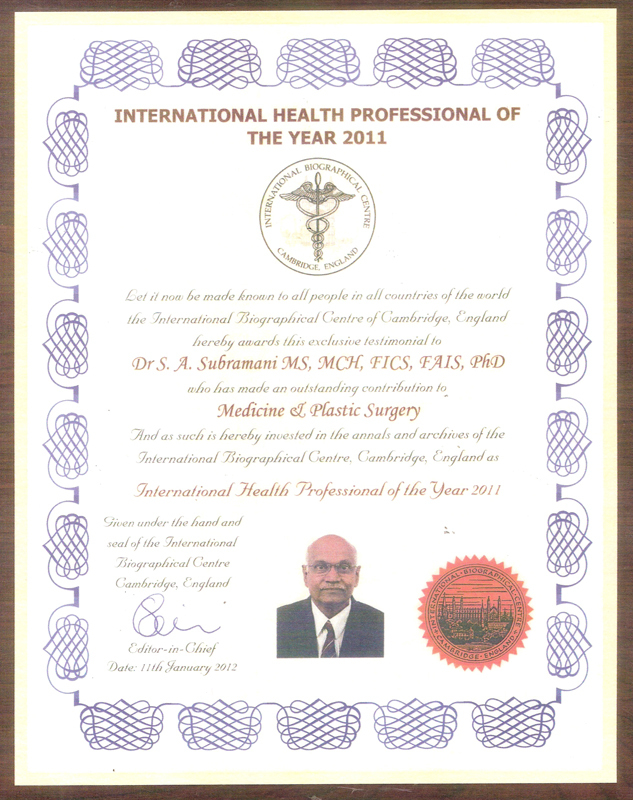 of General Medicine has been designated as 'Fellow' for his outstanding contribution to the field. Oncology OPD-DKA Block, State of the art paediatric wing and a hybrid world class operation theatre complex. VIMS & RC students shine once again by clearing June/ July 2015 RGUHS MBBS Phase III Part-II (RS2 & RS3) exams in huge numbers. The results for June / July MBBS Phase III Part-II (RS2 & RS3) are out. It is a proud moment for VIMS & RC as we’ve got 89% results. The students have been already posted for internship program starting October 10, 2015. The management, staff & students of VIMS & RC, congratulate the students of B.Sc Allied Health Science Courses, who secured highest marks and ranks out of toppers list announced by RGUHS during 2015. Host : The Department of Radiodiagnosis, Vydhi Institute of Medical Science and Research Center, Bangalore. The Department of Oral pathology and Microbiology welcomes you to Continuing Dental Education Programme dated 7th Feb 2015 on Forensic Odontology and its Applications with 6 CDE Points. Vydehi Institute of Oncology in Association with Radiation Oncologists of India, Karnataka State Chapter is organizing a Bi Monthly Meet dated 14th Feb 2015 on Advances in Radiation Treatment IMRT AND BEYOND with Registration free and prior Registration mandatory. The Oncology centre at VIMS carried out a highly succesful Oncology update VICON 2014 on December 13th 2014. To commemorate the International Disability week celebrations and mark the celebrations of 11th REHAB DAY, Vydehi Institute of Rehabilitation organized “Rehab Carnival” on December 13th, 2014. On behalf of Management , Faculties, Students and all members of Vydehi Family, we congratulate the WINNERS of AUTUMN MUSE 2014, held at St John's Medical College. This is to inform all concerned that IInd year 3rd term MBBS classes are starting from 18th September 2014. All students need to pay their Tuition and all other fees before the commencement of classes. The 1st year MBBS students are to attend Intensive Coaching starting from 15th September conducted by VIMS & RC. All the concerned students have to contact their respective departments- Anatomy, Physiology and Bio-Chemistry. This applies to students who have failed in their Final Examinations and those who did not take the examination. E-mail messages as well as letters have already been dispatched to concerned parents, who are required to co-operate by sending their son/daughter to attend the classes regularly. The RMO(Regimental medical officer of 4 Para (SF), Major Ritesh Goel, 1st batch student of VIMS does a marvelous job in the Kedarnath Cloud Burst and Floods. Skill Matrix 2013 was organized by Vydehi Institute of Medical Sciences and Research Center during the week of 2nd of December 2013 to the 6th of December 2013.This was an initiative undertaken to bridge the gap between medicine and education. Apart from this, it also reinforces Vydehi's commitment to continuous learning. It is conducted once in two years. Indira Gandhi Sadbhavana Award presented to Mrs. D.A.Kalpaja for Outstanding Individual Achievements & Distinguished Services to the Nation by His Excellency Dr. s.C. Jamir, Governor of Odisha on the 96th Birth Anniversary of Late Smt. Indira Gandhi on 21st November 2013 at New Delhi. Department of ophthalmology in Vydehi Institute of Medical Sciences and Research organized a free eye camp , on the occasion of the birth anniversary of our founder chairman, Late Dr. D.K.Audikesavulu, on Sunday 22nd September 2013. Mrs.Chairman inaugurated the program in the prestigious presence of VIMS director, Mrs. D. A. Kalpaja and Medical superintendent. Free spectacles and eye check up were provided for all patients who attended the program at Brindavan, Sri Sathyam Sai ashram, near Whitefield, Bangalore. The camp started providing the medical care from 9.30 am and concluded its services by 1.30 pm. It received a hugely positive feedback from the patients, as expected. 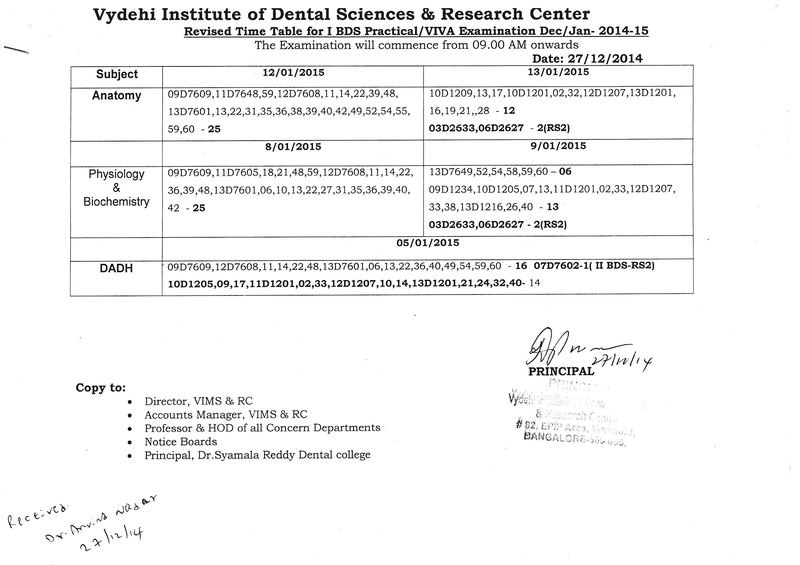 The regular classes for all allied health science UG courses in VIMS, for the academic year 2013-2014, will start from 17-10-2013, according to the RGUHS notification (No. ACA/ADM/Calendar of events/2013-14 dated 26-06-2013). The candidates in the following B.Sc. 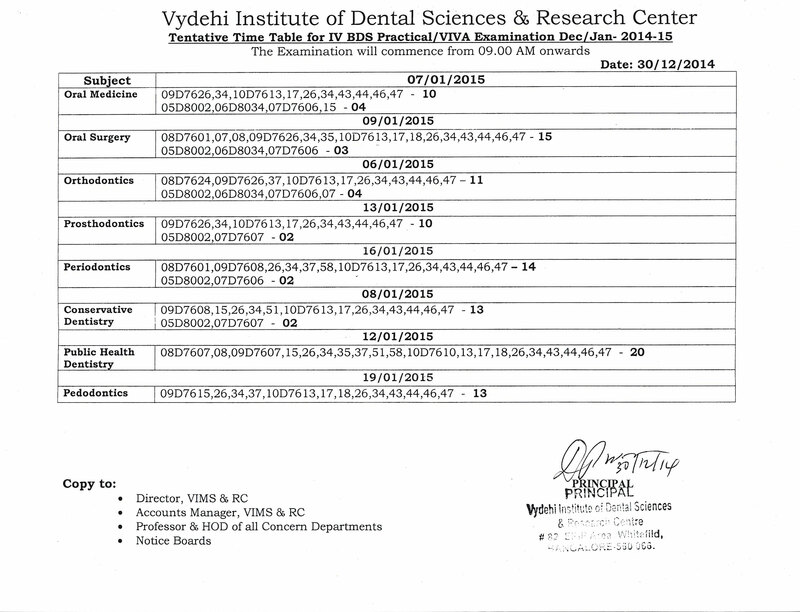 1st year and 2nd year (lateral entry) are hereby informed to report themselves to principal, Vydehi institute of medical sciences and research centre, Bangalore, along with the required documents on or before 17-10-2013. The ‘Freshers’ Day’ for them will be conducted on 21-10-2013. The online uploading of admission will begin from 05-10-2013 and the candidates must be physically present for the process. "FREE LIVER CAMP" from 22nd July to 27th July 2013 at VIMS & RC Hospital premises on behalf of World Hepatitis Day. All PG Students are hereby informed that PG Classes will be commencing from Friday - 5th July, 2013. VIMSRC GRADUATION DAY 2013 on 2nd April 2013 at College Auditorium. 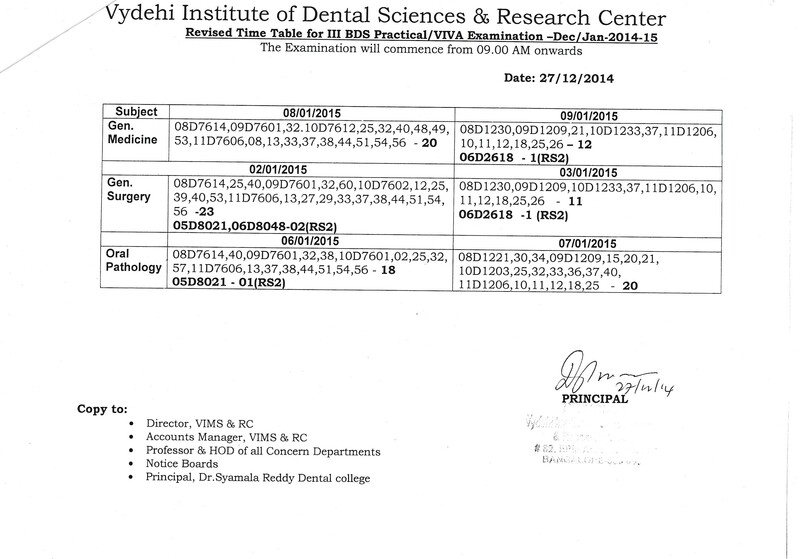 Vydehi Institute of Medical Sciences and Research Centre, the first Medical College in India has launched a concept of “INTENSIVE REVISION CLASSES” for the repeaters of 1st year MBBS phase I from 3rd April, 2013. Greetings from Vydehi Institute of Medical Sciences and Research Centre! To achieve excellence in medical education, Vydehi Institute of Medical Sciences and Research Centre, the first Medical College in India has launched a concept of “INTENSIVE REVISION CLASSES” for the repeaters of 1st year MBBS phase I from 3rd April, 2013.The instruction solely does not only help as a remedial measure, but will also bridge the gap through “Intensive Revision Classes”. Teams of experts are formed and lists as well, as scripts are made for delivering concepts. These classes will summarize all the concepts that were studied in the previous classes. The basic objective of this initiative is to create consolidated learning material that students can revise during their revision. The special revision classes is the most important phase of the examination preparation and it is of grave concern if your ward does not attend these classes. Kindly reinforce your efforts as parents to ensure 100% attendance at this vital stage and please accept no excuses from your ward. Failure to attend these classes will attract stringent punishment in terms of not allowing the student to take the university examination. Every year 26 th March is observed as PURPLE DAY or WORLD EPILEPSY AWARENESS DAY to create awareness among the public about epilepsy. The Neuro Sciences Department of Vydehi Institute of Medical Sciences in Whitefield has organized a large EPILEPSY AWARENESS PROGRAMME by wearing PURPLE on 26-3-13. On this occasion, the DIRECTOR of the Hospital Mrs. Kalpaja D released purple Balloons and a painting competition for SPECIAL CHILDREN was held with epilepsy as the theme. Rajiv Gandhi University of Health Sciences, Karnataka has organized the Fifteenth Annual Convocation on Monday, 25 March at 12 noon, at NIMHANS Convention Centre, Bangalore, Karnataka. His Excellency Dr. HansRaj Bhardwaj, Governor of Karnataka and Chancellor of the University, has presided over the function while Shri. S.A. Ramadass, Hon'ble Minister for Medical Education, Government of Karnataka and Pro-Chancellor of the University graced the occasion. Padma Bhushan Dr. B.M. Hedge, Former Vice Chancellor, Manipal University, Manipal has delivered the Convocation Address. Four dignitaries were conferred with “Doctor of Science” (Honoris causa) on this occasion. 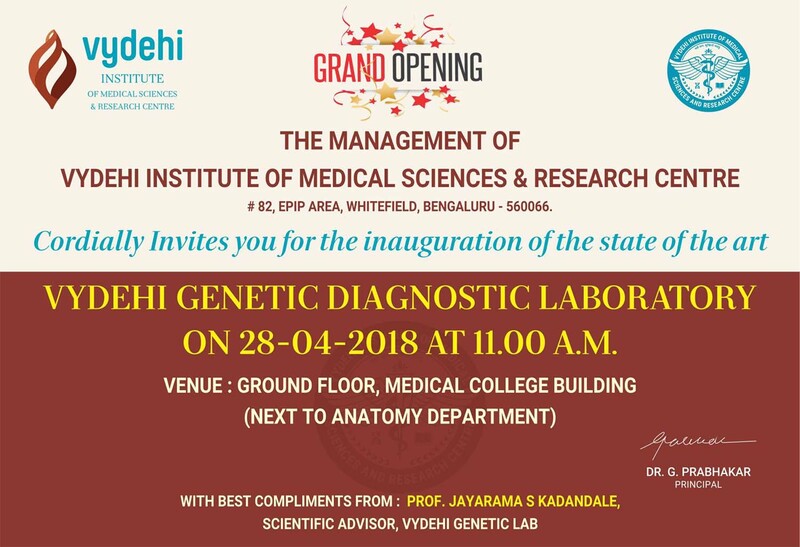 Dr. (Mrs.) S. Kantha Jadhav, who is the advisor of Vydehi Institute of Medical Sciences and Research Centre, is one among the four dignitaries. The others who were conferred in the function were Dr. S. Chandrashekhar Shetty, Dr. P. S. Shankar, Dr. Mahabaleshwara Maiya. On World Cancer Day 2013, Vydehi Institute of Oncology organized a seminar on advanced treatment methods in Oncology. On World Cancer Day 2013, Vydehi Institute of Oncology organized a seminar and guest lectures by Dr Shilin Shukla, the director of CGRI, Ahmedabad and Dr Arun Gere, Consultant, Nuclear Medicine and Pet CT Center, Dharamshila Cancer Hospital and Research Centre, Delhi. Dr Kavitha welcomed the guests while the program auspiciously began with a prayer. The program is inaugurated by Dr M.S. Ganesh lighting the lamp. He stated that VIMS will be releasing newsletters every month and sending to other hospitals and medical services, as part of their cancer services. Dr GuruMurthy, inaugurated the first newsletter that explains the advanced treatment methods in oncology by opening it for the audience. Vydehi Institute of Oncology inaugurates and releases a newsletter on the eve of World Cancer Day, which would be followed by similar monthly updates. MS Ganesh, head of surgical oncology centre, Vydehi Institute Of Medical Sciences & Research Centre spoke to The Hindu about the advance treatment methods in Urinary bladder cancer treatment. He said that the presence of the cancer is confirmed by a cystoscopy, which is a small endoscopic procedure and corroborated by investigations like MRI or CT scan. VIMS, known for its innovative methods in treatment of cancers, recently installed CT scanner, MRI imaging for radiation planning and other advanced radio therapy equipments for the better treatment for their patients. VIMS is one of the tertiary care cancer centers in India. Click this link below to read the full article published in The Hindu. 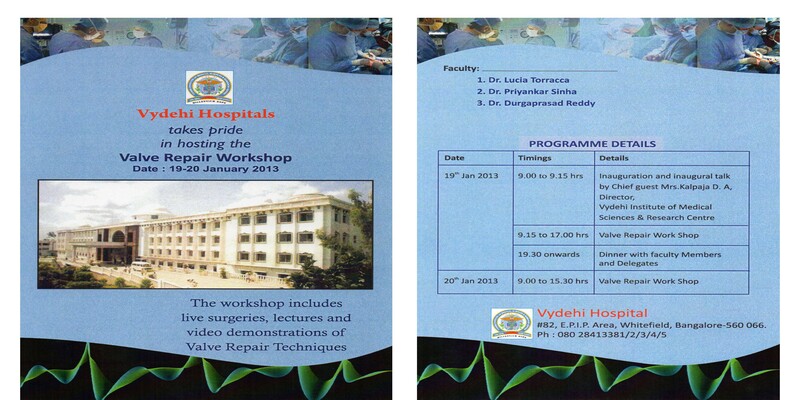 Vydehi Hospital - Valve Repair Workshop on 19th and 20th January, 2013. 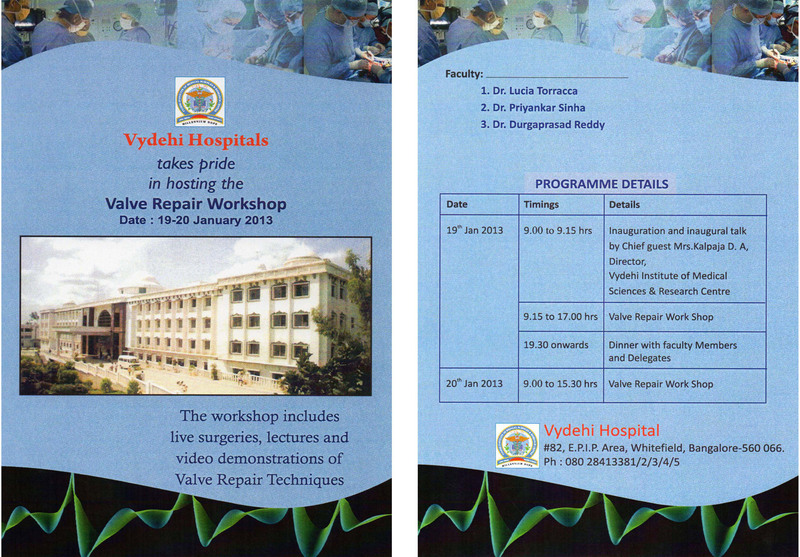 Vydehi Hospital takes great pride in hosting the Valve Repair Workshop for the surgeons, which discusses extensively about live surgeries, lectures and video demonstrations of Valve Repair Techniques, on 19th and 20th of January, 2013. The surgeons of Vydehi Hospital, Dr. Lucia Torraccca, Dr. Priyanka Sinha, Dr. Durgaprasad Reddy will be attending this highly informative medical workshop. Chief Guest Mrs. Kalpaja D.A, Director, Vydehi Institute of Medical Sciences & Research centre will inaugurate the Valve Repair Workshop. The program is scheduled to begin at 9 am in the morning and end by 9 pm, on 19th January 2013. Vydehi also organizes a luscious dinner with the faculty members and delegates after the workshop. The workshop, which discusses the new possibilities and challenges in Valve repair surgeries, will end by 20th Jan as scheduled. National conference of Association of Biochemists of India, 8th to 10th Dec 2012, announces “Best Poster Award”, at Bhubaneshwar. VIMS & RC introduces the "Department of Endocrinology"
Endocrinology is the science of hormones. It is one of the most rapidly evolving disciplines of medicine that encompasses a wide array of clinical conditions. Honorable High Court of Karnataka ordered in its WP 27726/2012 and WA 3957/2012 Directed Medical Council of India to grant permission for admission of 150 to 250 students to MBBS Course for the academic year 2012 -13. Dept. 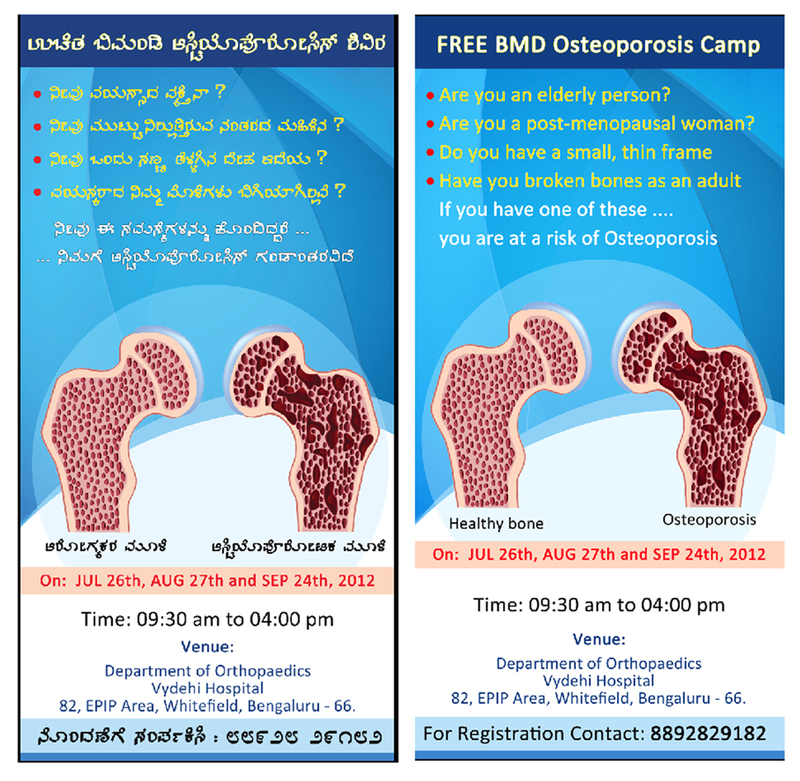 of Orthopaedics organizes BMD Camp at the Dept. OPD. For further details contact the department. Professor with Department of Special Education, Rehabilitation, & School of Psychology at California State University, Sacramento has been associated with Institute of Rehabilitation, VIMS & RC for 8 long years since 2004. We solicit the participation of all parents and students to Freshman's Orientation Programme for the PG & UG - Medical and Dental students, being organized on June 4th, 2012 at the College Auditorium. Bone tumors are rare malignancies that usually occur at a very young age (15 -35 yrs), seriously affecting life and quality of life as well. Conservative laryngeal surgeries are rare. Frontolateral hemi-laryngectomy is one such surgery that eradicates the cancer completely whilst retaining the voice intact. SYMPOSIUM ON RADIOLOGICAL IMAGING - "BEHIND THE IMAGE"
International Health Professional of The Year 2011 Dr S. A. Subramani MS, MCH, FICS, FAIS, PHD . The Mega General Health Camp conducted at Lakkur (Mallur Tq) in liason with HAL(Composite Manufacturing Division) attracted as many as 1620 patients in all age groups from the neighboring towns & villages.The camp was indeed a huge success as it was a very well coordinated team effort of all VIMS & RC doctors,paramedics & other staffs. Vydehi Institute of Medical Science and Research Center – MBBS 2006-2007 Batch celebrate "Graduation Day Ceremony 2012"
Neurosciences Centre of Excellence - "Department of Neurosurgery"
Vydehi institute of Neurosciences is an integrated institute, with a dedicated team of doctors equipped with the latest technology, which provides a comprehensive and multi-disciplinary care for brain and spine disorders. The World Cancer Day is celebrated every year on February 4th. World over many cancer organizations and other health care providers conduct events relevant to the occasion. To generate awareness and positive contribution from one and all a theme is created every year for the “World Cancer Day”..
Rajiv Gandhi Universtity of Health Sciences, Karnataka and Vydehi Institute of Medical Sciences & Research Centre in collaboration with Quality Council of India, New Delhi organized Orientation Programme for NABH Accreditation of Medical College Hospitals at VIMS & RC Campus on January 23-25, 2012. Vydehi School, a school for children with multiple disabilities, aims at identifying the strengths of each student and using those strenghts to learn skills required for daily living. Special education is provided for disfferent impairments such as cerebral palsy, autism, Down's Sysdrome, mental retrardation and other associated conditions. The school also provides modality training for the visually impaired and remedial education for students with specific learning disability. Children can benefit from the rehabilitation centre providing services such as occupational therapy, physiotherapy, speech therapy, aqua therapy, psychology and yoga. Offers Specialty and Super-Specialty services that includes state-of-the-art diagnostic facilities to ensure the delivery of holistic patient care. This was a very special day for all of us here. The celebrations took course in the form of cultural programmes by children with special needs. Children with visual impairment from Pundit Puttaraj Gowai Trust for Disabled sang the invocation song. The programme began with offering of flowers to the deity by the eminent guests and dignitaries. We solicit the participation of all parents and students to Freshman's Orientation Programme for the UG - Medical and Dental students, being organized on August 24, 2011 at the College Auditorium. Yolanda Gama Moreno, Early Childhood Special Educationist (ECSE) is once again here at Vydehi Institute of Rehabilitation. She is specialized in visual rehabilitation. Lighting the Lamp Ceremony - in reverence to Florence Nightingale. Vydehi Institute of Nursing Sciences and Research Centre hosted Lighting the Lamp Ceremony - in reverence to Florence Nightingale to initiate the nursing students into the noble profession of nursing. The Department of Plastic, Reconstructive and Cosmetic Surgery conducted the first Multi–specialty C.M.E. Programme entitled “Congenital Malformations in Children”, on January 28, 2011. Vydehi institute of oncology & RC invites you all for World Cancer day 2011. Vydehi institute of oncology & RC invites you all for the 2 days celebration of world cancer day going to held on 4th and 5th feb 2011. Vydehi Group makes a unique venture of bringing together all Super Specialties into one single Forum in Karnataka state. Shri. R. Ashoka and the Director of Vydehi Institute of Medical Sciences & Research Centre Mrs. D. A. Kalpaja, in the Vydehi Auditorium. The forum will serve as a platform for all super specialties to interact, exchange views and exhibit individual and institutional accomplishment. This forum will also help to impart teaching and training of post graduates in super specialties. The Department of Neurosurgery of Vydehi Institute of Medical Sciences, recently completed 200 major Neurosurgical procedures in 180 days. Vydehi Institute of Rehabilitation celebrated its 7th Rehab Day on 18th December 2010. MCI recognized MD pathology course granted by RGUHS at VIMS & RC for 2 students per year. "Medical Council of India, New Delhi recognized MD-Pathology qualification granted by Rajiv Gandhi University of Health Sciences, Bangalore in respect of students being trained at Vydehi Institute of Medical Sciences and Research Centre, Bangalore for 2 students per year"
Vydehi Nursing College Celebrates World Breastfeeding week 2010 by educating awareness among people from channasandra, Kadugodi, Sarjapura PHC and Kalkute, Bangalore regarding the breastfeeding of your babies. “Orientation Programme 2010” for the staff nurses of Vydehi Hospital, Bangalore. Inauguration of “Orientation Programme” 2010 for the staff nurses of Vydehi Hospital, Bangalore. 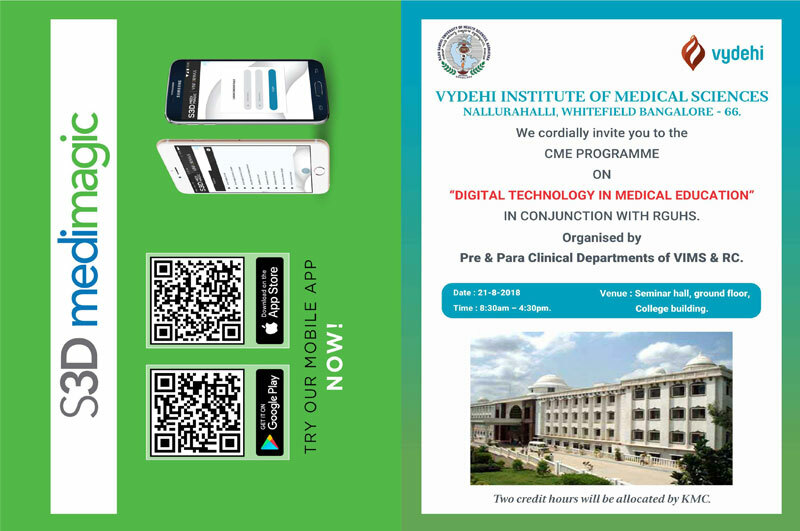 You are cordially invited for the inauguration of “Orientation Programme” for the staff nurses of Vydehi Hospital, Bangalore on 21/7/2010 by 2 pm at Seminar Hall, VIMS&RC . Admission for the academic year 2010-2011 for MBBS,BDS courses for management quota seats is completed and all the seats are filled as per MCI/DCI and Government of Karnataka rules and regulations. 100% result in MSC nursing exam undertaken in 2009-2010. Vydehi Institute of Nursing Sciences and Research Centre achieved 100% result in 1st and 2nd year MSC Nursing exam undertaken in 2009-2010. In view of Br. Asthma day on May 4th 2010, an educational and awareness camp regarding Allergic Rhinitis and Br. Asthma conducted by TB & Chest Disease OPD on May 27th 2010 from 10 AM to 2 PM. Achieved 100% result in final year MBBS exam conducted in June 2009. Eminent Neuro Surgeon Dr. H. V. Satish Babu (Professor & Head , Neurosurgery Division) joins at VIMS & RC. Department of Physiology & Pharmacology , VIMS & RC in association with APPI , Bangalore Chapter conducted State Level CME on “Stem Cells” Research & Clinical Applications at Vydehi Medical College on Monday 24th May 2010. Admission for UG Courses in Medical, Dental, Biotech, Nursing and Paramedical Sciences 2010 -2011 academic year. List of selected candidates for the interviews held on 15th & 16th February 2010. List of selected candidates for the interviews held on 15th & 16th February 2010. Need to report on 23/02/2010. Continuing Dental Education Program (CDE) on 19 February 2010. 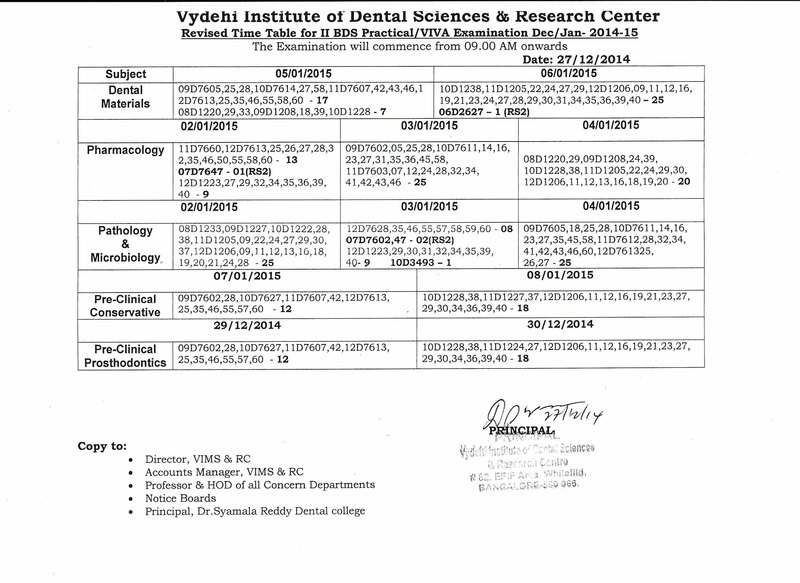 Cordial invitation from Department of Oral Maxillofacial Pathology for Continuing Dental Education program on 19th February 2010 at Seminar Hall, Vydehi Institute of Medical Sciences & Research Centre. Dr.Yashaswini the MD radiation oncology post graduate, presented a case of retinoblastoma treated at Vydehi Institute of Oncology, in the recently held " genetic factors in retinoblastoma" conference conducted by Narayana Nethralaya. Lamp lighting ceremony of 7th batch of B.Sc (N) and 8th batch of GNM students on 08/02/2010 at Vydehi Institute of Nursing College & Research Centre. World Cancer Day Celebration at Vydehi on Jan, 4th 2010. Mr. S. Sowmya Narayanan, invited as a National Faculty for the LIVE IMRT Workshop conducted during International Conference on Head & Neck Cancer. Mr. S. Sowmya Narayanan, Chief Medical Physicist has been invited as National FACULTY for the LIVE IMRT Workshop conducted during International Conference on Head & Neck Cancer, dated 22,23 Jan 2010, jointly organised by Regional Cancer Centre, Trivandrum and National Cancer Centre, Singapore. Cordial invitation to CDE Program on 28th January at Medical College Seminar Hall. Eminent Neuro Surgeon Dr. Ali Hakim Messiwala, Director Neuro Logical Surgery visited Vydehi. Eminent Neuro Surgeon Dr. Ali Hakim Messiwala, Director Neuro Logical Surgery Southern California, Centre for Neuro Science & Spine, Los Angeles and Pomona, California. Visited Vydehi Hospital from 10-01-2010 to 12-01-2010 and conducted surgeries at Vydehi Hospital. He also delivered Guest Lecture at VIMS & RC, he visits Vydehi every 3 months and there will be exchange program for training Neuro surgeons by Ali Hakim Messiwala. Workshop/CME on Chronic Pain Management on 18th January, 2010 at 10:00AM at Medical College Seminar Hall. Achievements of Mr. S. Sowmya Narayanan in various verticals of Oncology. Mr. S. Sowmya Narayanan, has present Scientific Paper in 10th ESTRO Conference, Netherland & he was the only invitee from India to deliver lecture on IGRT in Varian's European Users' Meeting. Workshop on Nursing Service administration held at Vydehi Institute of Nursing Sciences & Research Center Conference hall. Free OPD consultation for patients in super specialities of cardiology, nephrology, & neurology to commemorate the 85th Birthday of Bhagawan Sri Sathya Sai Baba. Dr. (Maj. Gen) A.K. Jaiswal, Prof. & HOD of Dermatology, Awarded Prestigious Legendary Dermatologists / Teacher Par excellence for the year 2009, By the Indian Association of Dermatologist, Venerologist and Leprologist for his outstanding contribution to the development of Dermatologists in India. Dr. M.S.Ganesh was chosen by the FEDERATION OF INDIAN CHAMBERS OF COMMERCE AND INDUSTRY (FICCI) to peer review the information developed on breast cancers. Press Release on Forensicon-2009, 17th Annual State Level Conference of Karnataka Medico Legal Society. Snapshots of 17th Annual Conference of FORENSICON 2009 held at VIMS & RC on 13th November. D.K. Audikesavulu, Chairman of Vydehi Institute, donated Rs. 10 Lakhs towards food, bed sheet, medicine etc. to Karnataka and Andhra Flood Victim's. Glimpses of Vydehi & Mallya Heart 10 K run conducted at Vydehi Campus Bangalore on World Heart Day. Mr. Abdul Gani of 55 yrs, a case of “coronary artery disease with diabetics mellitus, syt. Hypertension, Hypothyroidism with Multiple infarcts in brain and severe renal dysfunction and totally blind came to Vydehi hospital with severe dehydration and unable to walk. Patient was immediately shifted to Cardiothoracic ICU stabilized and CABG performed successfully with no focal neurological deficit and good renal function. "FORENSICON-2009" - 17th Annual Conference on 13th-15th November 2009 is organised by Vydehi Institute Medical Sciences & Research Centre and Karnataka Medico Legal Society - State Organisation of Forensic Medicine Experts. March 12, 2009 is World Kidney Day: In World Kidney Day, the main purpose of Vydehi institute of medical Science and Research Centre is to raise awareness about the importance of our kidneys- an amazing organ that plays a crucial role in keeping us alive and well – and tell to public that kidney disease is common, harmful and treatable. February 4, 2009 is World Cancer Day: World Cancer Day is a global observance that helps raise people’s awareness of cancer and how to prevent, detect or treat it. On World Cancer Day, Vydehi Institute of Medical Sciences and Research Centre is work to help the general public learn more about the different types of cancer, how to watch for it, treatments and preventative measures.